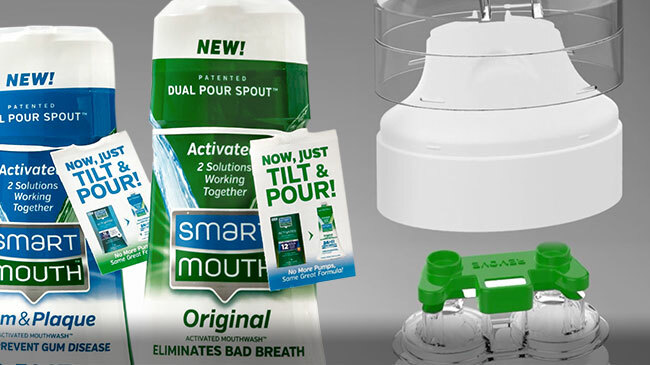 Enhancing the consumer experience influenced every decision made on a mindful path to successful manufacturability and commercialization of SmartMouth™ from Triumph Pharmaceuticals Inc. According to the team at Triumph, innovation had to equal ease of use rather than be innovation simply for the sake of innovation. They knew they could count on TricorBraun to get them there. “There’s a technology and a science in what we do and that’s why we’re the superior oral care product. We’ve had a long term, ongoing business relationship with TricorBraun because of their superior service, support, communication and willingness to do whatever it takes. They are an amazing partner,” explained Ron Kappauff, VP of Sales & Marketing at Triumph Pharmaceuticals. 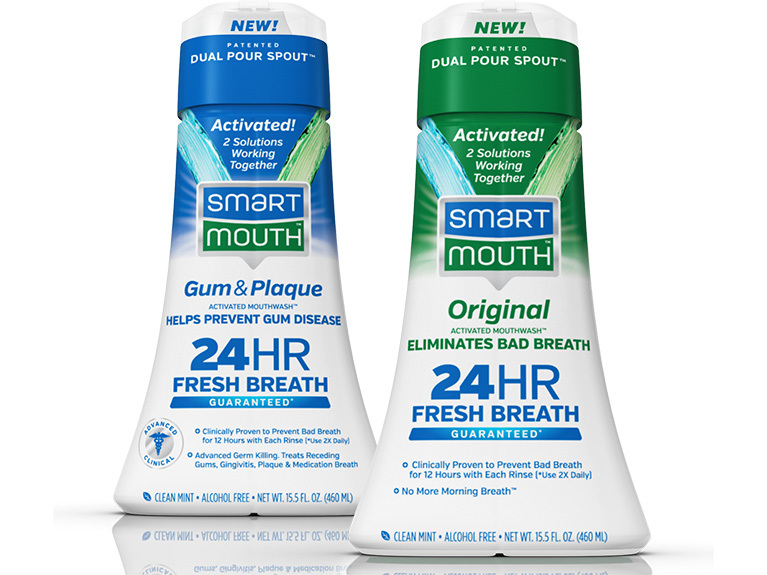 SmartMouth™ Mouthwash is a unique, dualbottle delivery system that allows you to mix the two solutions together prior to dispensing so that each time you rinse you have freshly activated the ingredients for lasting results. Solution #1 contains an odor eliminator and solution #2 contains zinc. When you mix the two together, it releases a huge number of zinc ions. Zinc-ion technology blocks germs’ ability to ingest protein particles which means no new sulfur gas production and therefore no new bad breath. Prior to use, the two solutions must be stored in two separate PETE (polyethylene terephthalate) bottles to avoid cross contamination. “Keeping our retailers happy was important,” according to Kappauff. He explains further that retailers were interested in a trade up by consumers, a high margin, repurchase rate and maintaining the current footprint. And although the package ended up slightly taller, it fortunately did not affect the footprint. 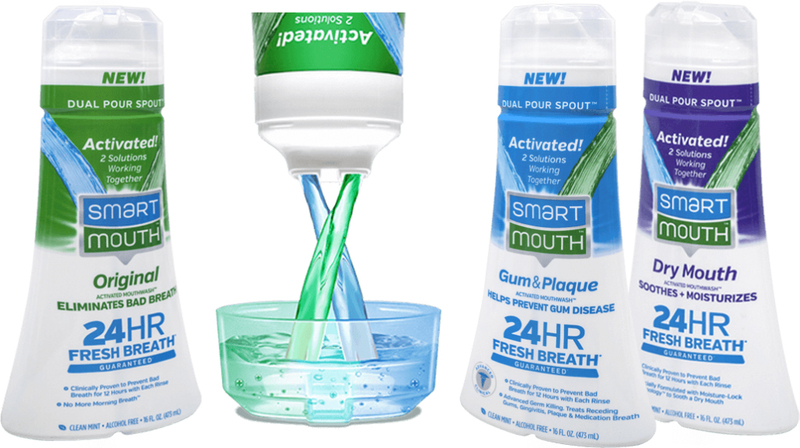 SmartMouth™ Mouthwash is available in 3 SKUs; Original, Gum & Plaque, and Dry Mouth. If the packaging fails, there is no repeat purchase. Packaging must be, to a degree, an invisible part of the usage experience. Two things are highly valued by people above other matters when using packaging. If the packaging is difficult to use or requires jumping through hoops in order to use the product, customers will dislike it and it will fail. People are attracted to visually interesting packaging that they associate with their own lifestyle. Your packaging should fit your target market. Attraction is generally a quick process. Consumers in the supermarket are bombarded with colours, shapes, and messages. Standing apart from competitors with just the naked product as a representative can be challenging. How big is your product? How much space does it physically take up on the shelf? Too big may not fit, too small won't be noticed. The design of the packaging must be in line with the consumer's vision of what he/she wants. Brands have little time and space to make that happen. Nottingham Spirk was hired to redesign the existing package and the result was something consumers had never seen before – it involved eight different components. These included two PETE bottles, a PETG stage (patent pending), a foil seal, a foil protector, a spout (patent pending), an overcap and a shrink sleeve.Previous to this new design, the bottles were not connected by a shrink sleeve but were sold together in one box. Eight different package components meant six different potential leak points requiring extensive testing and validation. Leak analysis, dimensional analysis, foil analysis and spout application were just a few of the areas that were tested and adjusted as needed. Communication and interaction by all parties including TricorBraun’s US and China offices, Triumph, Nottingham Spirk, Currier and the co-packer were crucial. “TricorBraun folks are experienced, knowledgeable and know what is possible. They are relentless until they get there. They have the right resources and the right people to get the job done,” Andrew Burch, CEO, Triumph Pharmaceuticals. According to Matt Ramsdell, Director of Project Engineering at TricorBraun, the million dollar question asked repeatedly by the team was, “Is it functional?” TricorBraun validated the dimensions of every part and fit. “The stage was definitely the most difficult. The product wasn’t blowing out the tubes so we had to open the gate in the tools so that more plastic could go in. Even though the manufacturing would be done here, we were able to keep costs down with molds and injection parts by utilizing Asia location. The tweaks to the design tookabout three months and functional testing took about seven months,” explains Ramsdell. Per Triumph’s direction, TricorBraun has continued to tweak the package throughout the process to enhance the consumer experience and the CIP (Continuous Improvement Program) will focus on improving line speed. All changes will be implemented in January with the start of production. According to the Triumph team, it is important to consider that the consumer has never seen this design before. It is also important to note that while experienced consumers can open the package in 35-40 seconds, a novice might take a few minutes. Ease of use becomes essential to repeat purchases. In this regard, the continuous improvement program is that much more important. Triumph goes on to note that one of the biggest challenges has been the multiple iterations of the shrink sleeve where the use instructions are explained. To further clarify how to use the product, a video has also been developed and can be found on their website. SmartMouth bottles and components will be warehoused and distributed from TricorBraun in St. Louis.